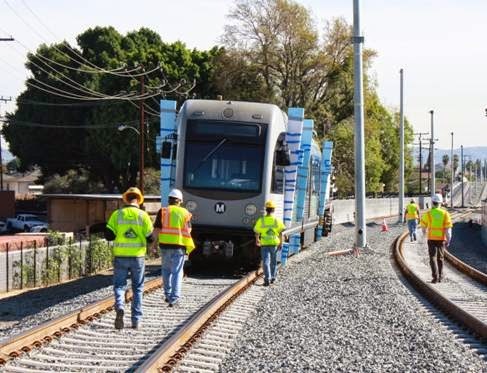 "At dawn, a light rail vehicle from Metro’s fleet entered into the Foothill Gold Line project jurisdiction for the first time. The vehicle, a $4 million AnsaldoBreda P2250 weighing over 100,000 pounds, was outfitted with specialized gear to test clearances, wheel/rail interface, rail switches, and the Overhead Catenary System. The testing will take place over the next two weeks between Arcadia and Irwindale and include live wire testing between California Ave in Monrovia and the San Gabriel River Bridge in Irwindale, where power is now energized."